Bubba Watson curled a shot from out of the pine straw and safely onto the 10th green to win the 2012 Masters on the second hole of a playoff Sunday over South Africa's Louis Oosthuizen. Both players finished regulation at 10-under 278. Watson won the 2014 Masters Tournament by three shots, with a score of −8. He entered the final round tied for the lead with 20-year-old Masters rookie Jordan Spieth. Playing together in the final pairing, Spieth birdied the seventh hole for a two-stroke lead over Watson. However, the momentum turned on the par-5 eighth hole. Spieth had a birdie putt, but ended up three-putting for bogey while Watson birdied to pull into a first-place tie. Then, on the ninth hole, Watson birdied again while Spieth bogeyed, and the four-shot swing over two holes gave Watson a lead that he never relinquished in a win over Spieth and Jonas Blixt. With the win, Watson became the 17th player to win the Masters two or more times. The win moved him again to number four in the Official World Golf Ranking. 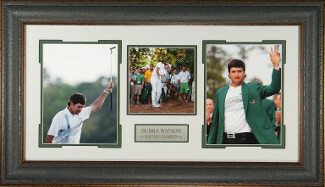 This is a Bubba Watson 3 Photo Piece from the 2012 & 2014 Masters with Custom Matting and Premium Leather Framing to Approx 17x35 size.